It's Winter and, this time of year, everybody ought to be thinking about wiper blades. Since 2006, I've been using PIAA "Super Silicon wipers on some of my cars, including my 2004 Z06, and man...are they great! The reason PIAA Silicon wiper blades work so well is the combination of the Silicon rubber compound used in the blades and PIAA's Windshield Treatment Solution which you apply to the glass prior to installing them. The Treatment Solution seems similar in application procedure and results to "Rain-X" but more long-lasting. Since the Super Silicon wiper material tends not to wear down the Treatment as fast as would conventional blades, the aggressive beading effect imparted by the Treatment Solution lasts a long time. We've been testing Super Silicon Wiper Blades on a C5, a 4th Gen Camaro and an S-10 Blazer with good results in all three cases. They offer better resistance to heat, ozone, ultra-violet and wear. These wipers seem less prone to squeaking and dragging, regardless of the shape of the windshield. 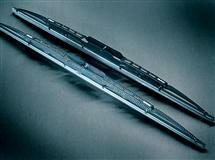 PIAA says its Silicon Wiper Blades maintain sharp, clean edges, even after 230,000 operations. To put that in perspective, if your wipers cycle once every 2 seconds, that's a bit over 125 hours of continuous operation. While I admit, even in eight years, I haven’t run them for 125 hours, I can say that the durability of PIAA’s Super Silicon wipers is the best I’ve ever experienced from any wiper blade, even GM’s OE blades which are pretty good. In fact, the durability of Super Silicon is so good that the pair I put on my C5 are still in service. The pair I put on the Camaro, which is a daily driver and sits outside when not in use, lasted until this year–from 2006 to the end of 2014–that’s eight and a half years not only wiping water but also being exposed to the sun’s UV radiation every day. PIAA claims their wipers last two times as long as “standard wipers”. Heck, I’d say it’s longer than that because I’ve had some conventional, aftermarket rubber wiper blades last as short as a year. Replacing your stock wiper blades with PIAAs is quick and easy. Remove your old wipers, apply the PIAA Windshield Treatment Solution per the instructions on the package, attach a pair of the adapters PIAA supplies to your wiper arms then install the Super Silicon wipers. Once you’ve got them installed, PIAA wipers can offer a two-fold improvement in wet weather vision and safety. Water beads into droplets at low speeds that are easily removed by ordinary wiping. At higher speeds, wind velocity pushes the water off the windshield, sometimes even without requiring wiper use. When the wipers are working, silicon coating also reduces drag and eliminates annoying and inefficient chattering to provide greater comfort for both driver and passenger. And the best part is that Silicon Wiper Blades reapply the coating every time the wipers are used. So, I said earlier that the PIAA Super Silicon wipers have been on my C5 for eight years. That had me wanting to put PIAAs on the C6 I bought two years ago. In early 2014, the PIAA folks introduced yet an even better wiper blade called “Aero Vogue” so that’s what I put on it. This new wiper uses the same silicone technology, which reduces surface tension, causing water to repel from the windshield for streak free and quiet operation but with the addition of a plastic fairing, or what PIAA call an “aero style cover”, over the top of the wiper assembly. The lower front of this cover is shaped sort of like the “splitter” one sees on the front of race cars and even some stock Corvettes. The top rear of this faring has two vents in it. Once forces air, up and over the top of the wiper and the other lets any air trapped under the wiper to exit to the rear. The point of those features is to keep airflow from causing “wiper blade lift” at high speed and that tends to reduce blade chatter. Besides the high-speed blade anti-chatter/lift features, the Aero Vogues just look cool. Aero Vogue wipers use the same refills as do PIAA’s Super Silicon blades. For more information on PIAA Super Silicon or Aero Vogue wipers, see the PIAA web site. Pros: They offer better resistance to heat, ozone, ultra-violet and wear, out-performing the industry standard in all those categories. These wipers seem less prone to squeaking and dragging, regardless of the shape of the windshield. It's Fall 2007 and this time of year, everybody ought to be thinking about wiper blades. For over a year, I've been testing PIAA "Super Silicone wipers from Weathertech Automotive Accessories on some of my cars, including my 2004 Z06, and man...are they great! The reason PIAA silicone wiper blades work so well is the combination of the silicone rubber compound used in the blades and PIAA's Windshield Treatment Solution which you apply to the glass prior to installing them. The Treatment Solution seems similar in application procedure and results to "Rain-X" but more long-lasting. Since the Super Silicone wiper material tends not to wear down the Treatment as fast as would conventional blades, the aggressive beading effect imparted by the PIAA Treatment Solution lasts a long time. We've tested Super Silicone Wiper Blades on a C5, a late-model Camaro and an S-10 Blazer with good results in all three cases. They offer better resistance to heat, ozone, ultra-violet and wear, out-performing the industry standard in all those categories. These wipers seem less prone to squeaking and dragging, regardless of the shape of the windshield. Weathertech says its Silicone Wiper Blades maintain sharp, clean edges, even after 230,000 operations and just to put that in perspective, if your wipers cycle once every 2 seconds, that's a bit over 125 hours of continuous operation. Replacing your stock wiper blades with PIAAs from Weathertech is quick and easy. Remove your old wipers, attach one of the adapters Weathertech supplies to your wiper arms then install the Super Silicone wipers. PIAA wipers from Weathertech offer a two-fold improvement in wet weather vision and safety. Water beads up into droplets at low speeds that are easily removed by ordinary wiping. At higher speeds, wind velocity pushes the water off the windshield, often without even requiring wiper use. The silicone coating also reduces drag and eliminates annoying and inefficient chattering to provide greater comfort for both driver and passenger. And the best part is that Silicone Wiper Blades reapply the silicone coating every time the wipers are used. That they leave behind a slight silicone residue seems to work very well as all the sets of Super Silicone wipers we're testing have been in service for more than a year and still wipe the winshield streak-free. Weathertech's PIAA Super Silicone wiper blades are available at www.weathertech.com.